My grandmother, Talitha Cuma Cheney Eggleston died at a young age. At least from my present perspective it seems a very young age. I never had the privilege of knowing her. 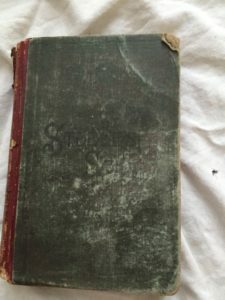 When I was compiling histories for the Cheney Wilson Family History Book, I realized that she was the only member of that family no one had written about. So I set out, as one who had not known her personally, to write a history of her life. This is taken largely from that account, with some additional photographs. 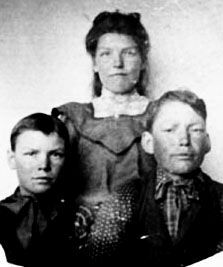 Talitha Cuma Cheney was born May 3, 1893 in South Park, Wyoming. She grew up as on only daughter, with several brothers, all but one older than her. Her parents, Selar Cheney and Mary Alice Wilson, had another daughter Mary Ellen, but she had died as a child in Wilsonville, long before Cuma was born. Talitha Cuma is sitting on her father Selar’s lap. To the right of her is her grandmother Talitha Cuma Garlic Avery, whom she was named after. Other family members are Howard, David, Mother Mary Alice holding Fleming, and Selar Sylvester and Ralph standing in the back. Talitha Cuma was named after her grandmother, Talitha Cumi Garlick Avery Cheney, though she went by the name “Cuma”. In some places it was written Cumi or Cumy, though her daughter Alice said she preferred Cuma to Cumy. At the time Cuma was born, the South Park community consisted mostly of her extended family, so her childhood would have beenspent with her brothers and several cousins. Education was very important to this family. The first school was organized in Jackson Hole in 1896. Cuma was too young to attend when the school first started, but was privileged to have this available from the time she was ready to start school. A 1899 souvenir card of School District No. 37 in Jackson lists 16 pupils with Cumy Cheney listed last, as she was probably the youngest. 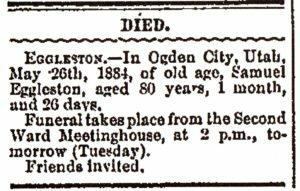 I learned interesting things from the Obituary and Will of Samuel Eggleston. 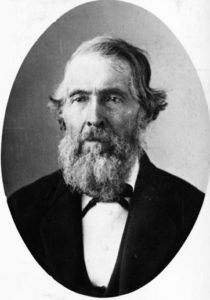 Samuel Eggleston died May 26, 1884 in Ogden, Utah. A Notice of his death was printed in the Monday edition of the Ogden Daily Herald. Catherine Kat Eggleston has always been somewhat of a mystery to me. It was only recently that I found, through what others have posted to FamilySearch, that her full name was Trijntjie Catherine Kat Eggleston. I found other bits of very intersting information there. She is still somewhat of a mystery, but now a much more intriguing and fascinating mystery. 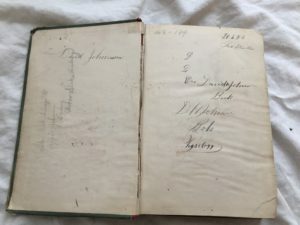 The first I knew of Catherine was from Orson Hyde Eggleston’s Family Bible. 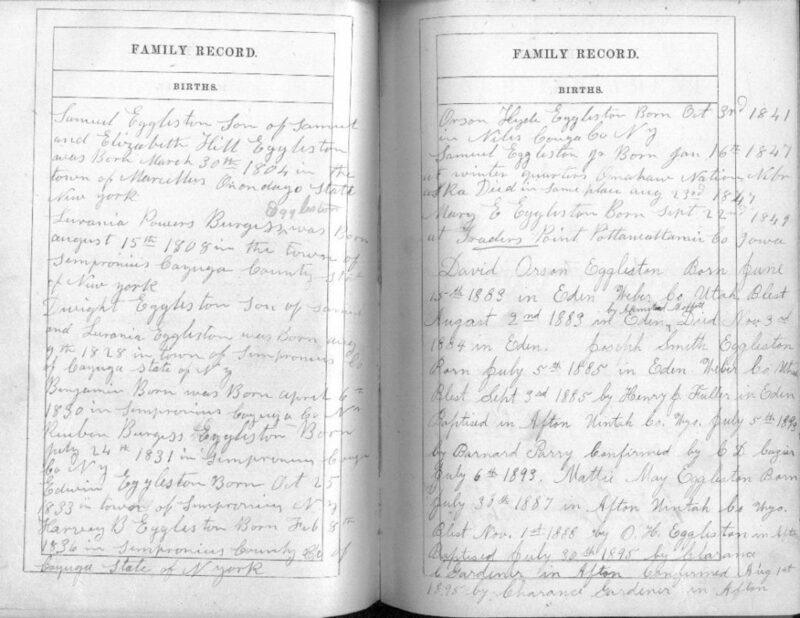 The record there lists 3 wives for Orson’s father Samuel Eggleston. His first wife, and the mother of his children, was Lurania Powers Burgess. The record lists 2 other marriages which both occurred shortly after Lurania’s death in July 1870. 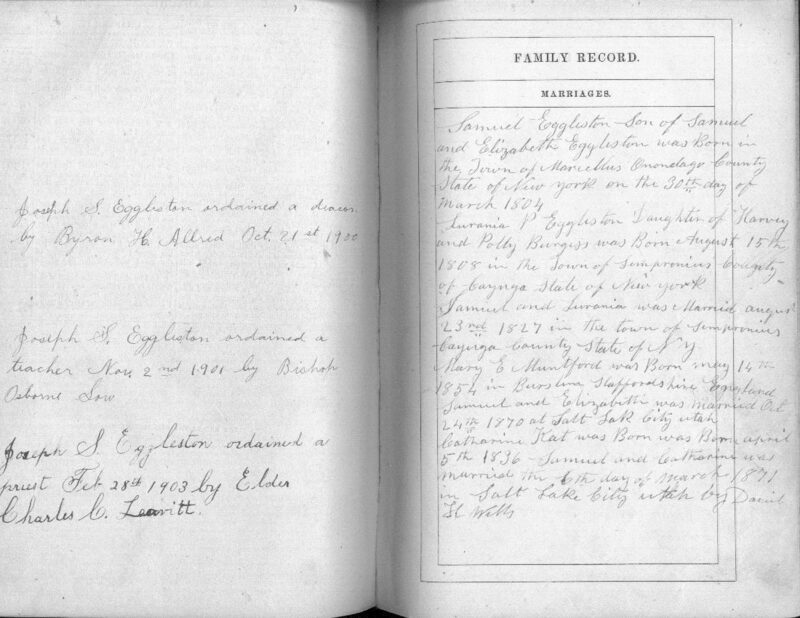 Samuel married Mary Elizabeth Mumford October 24, 1870. She is a total mystery. I have found no other information about her and she seems to have disappeared from Samuel’s life very shortly after this marriage. Samuel was married to Catherine Kat March 6, 1871 in the Endowment House in Salt Lake City by Daniel H. Wells. Catherine was born April 5th, 1836, making her 35 years old at the time. Samuel was 67. Ephraim Johnson and his twin brother Jacob were born March 20, 1876 in Eden, Weber, Utah to Peter Johnson (Jorgensen) and Ane Marie Madsen. Their father, Peter Johnson, an immigrant from Denmark, had a farm there. 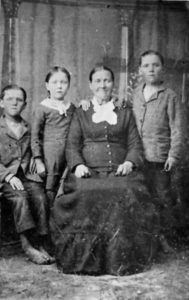 Peter died in December 1878 after he was caught in a snow storm and became ill. Thee twin boys were just over two years old when their father died. Their younger sister Agnes was just a baby. Jacob Johnson and his twin brother Ephraim were born March 20, 1876 in Eden, Weber, Utah to Peter Johnson (Jorgensen and Ane Marie Madsen. Their father, Peter Johnson, an immigrant from Denmark, had a farm there. Peter died in December 1878 after he was caught in a snow storm and became ill. These twin boys were just over two years old when their father died. Their younger sister Agnes was just a baby. Education was important to this family. David related that all eight of the children were sent to school whenever it was in session. A great amount of learning was impossible but they had the opportunity to take advantage of whatever was available. I have inherited a number of text books that belonged to David and his siblings. 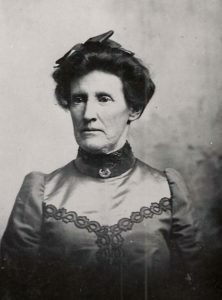 Constant Ann Stephens was born February 17, 1849 at Council Bluffs, Potawattamie Co. Iowa, the daughter of John Stephens and Elizabeth Briggs. She was the ninth of twelve children. Constant’s father had a farm at Council Bluffs. She crossed the plains at the age of two, arriving in Utah October 14, 1851. Her father was a Captain of ten in the Orson Pratt Company. The family resided in Weber County. Her father built the first reservoir in Weber County in 1856. Little is known of the details of the life of Harvey Burgess Eggleston. He was just becoming an adult when his life was cut short. We can only imagine what his life would have been like if he had lived, and wonder about the circumstances of his death. Harvey Burgess Eggleston, the 5th child of Samuel and Lurania Powers Burgess Eggleston, was born February 8, 1836, In Sempronius, Cayuga County, New York. He was named for his grandfather Harvey Burgess. His parents lost their first 2 sons as infants, so when Harvey was born he had two older brothers. January 16th marks the anniversary of the birth of Samuel Eggleston, son of Samuel and Lurania Powers Burgess Eggleston. His birth, life and death occurred during a very dark time and place in the lives of his family and the larger community of Latter-day Saints. Early in 1846, the Saints were forced to leave their homes in Nauvoo, Illinois. 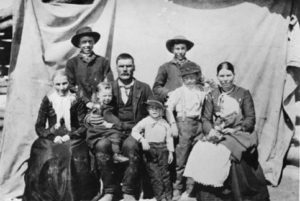 The Eggleston family were not among the first to leave. They stayed until sometime in the spring of 1846 according to Samuel’s account. They may have stayed longer than others for financial reasons, or to help with the completion of the Temple which was dedicated May 1, 1846. The Egglestons traveled to Winter Quarters in Nebraska, where the Saints had gathered to prepare to go further west. Small cabins were built where they spent a miserable winter. There was inadequate food for the many refugees camped there. There was also much disease which was easily spread. Many people died during that year, especially the very young and very old. Lurania Powers Burgess Eggleston, who was 38 years old at that time, gave birth to a son on the bleak winter day of January 16th. Patty Sessions was a prominent midwife during that time. Fortunately for us, she kept records in her diary and an account book. Her notation under the date of 16 January was “Put sister Eggleston to bed with a son Samuel E.” “Putting to bed” was her way of noting the confinement and delivery of a baby. Patty’s account book showed that Samuel Eggleston paid $2.00 for her services January 16.